Holland Park has kept its own bees for the past few years and the result has been excellent honey, bought by those quick enough to do so before it sells out. Does any member have beekeeping experience, or know someone who does, with time to commit to managing Holland Park’s four hives? An alternative would be someone who already keeps their own bees and is prepared to establish some of them in a new home in our park. A local resident is preferred so as to be able to deal with any swarming problems. Pigeons are becoming a real pest in Holland Park, largely because some people insist on feeding them. The café is a prime site for the birds to forage for food left on tables and dropped on the ground – but maybe no more. 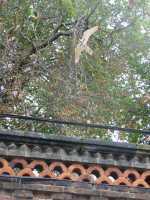 Our Parks Police had the clever idea of putting a fake hawk in the trees above the café. Suspended from a long pole the hawk is meant to swoop and ‘fly’ realistically enough to scare off the pigeons but this one is obviously still a learner and tends to get caught up in the branches. It has however convinced the pigeons it is a danger, and café users have reported fewer of the unwelcome birds than for many years. Let us hope the pigeons are not bright enough to work this one out.